System Mechanic is a unique tool for speeding up your personal computer and fix its problems automatically and it has won over 300 Editors Choice and 5 star awards since its creation in 1998 and it is considered to be the number one optimization software in the world. It allows automatic repair of errors and it fixes fragmentation of your drives. It helps out by cleaning out clutter and fine tuning and optimizing your personal computer in order to run smoothly. It makes your PC more reliable and it speeds up its work and processing time up to 300%. It is licensed shareware software but it features a free fully functional trial version. System Mechanic features more than forty tools and more than two hundred critical tests and repairs that will provide the ultimate solution for complete care of your PC. Some of the most important features are the speed up of Windows start up, fixing of stubborn errors and computer freezes, reclaiming of lost memory space, safe fixes for registry errors and bloats, restoration of stability and performance and acceleration of the overall gaming experience. 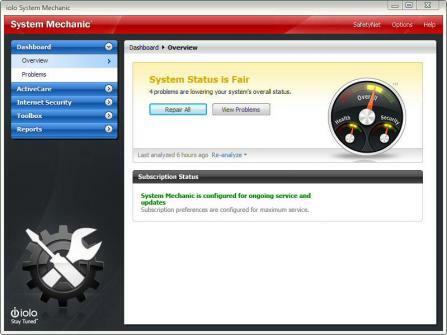 System Mechanic is easy to use and it provides complete care for your PC regardless of your computer knowledge and using skills. A powerful single click tool called PC accelerator will be able to supercharge your system thus improving your PC’s Windows performance up to 300%. Are you ready to say goodbye to slow and poor performance of your PC forever?